Palo Verde Cancer Specialists consist of a multi-specialty group of board certified cancer experts, that specialize in Radiation Oncology, Medical and Hematology Oncology and Urology. Our specialists work with each patient to determine the best action plan for improved outcomes and the best chances of overcoming cancer. We work closely with our referring physicians to determine the best treatment option for each of our patients unique conditions. If you’ve been diagnosed with any type of cancer, don’t settle on a treatment plan until you’ve learned about the groundbreaking CyberKnife Robotic Radiosurgery System. With CyberKnife, the radiation oncologists at Palo Verde Cancer Specialists can target your tumor with high doses of radiation to kill the cancerous cells without the need for surgery, anesthesia, or hospital stay. The CyberKnife can reach cancers at thousands of angles and in hard-to-reach places with sub-millimeter accuracy, tracking your tumor even as you breathe. And, it’s clinically proven effective as a cancer treatment for the whole body. With CyberKnife, patients don’t have to undergo surgery to remove the tumor. This is important for those tumors that are inoperable, or in hard-to-reach places. It’s also effective for patients who aren’t physically able to have surgery, or who just don’t want lessen the risks or shorten the time needed for recovery. Instead if a real scalpel, CyberKnife uses a high dose beam of radiation to cut through directly to your tumor location. The radiation kills the cancerous cells, leaving the healthy tissue and organs unharmed. No surgery means no anesthesia, no hospital stay, no long recovery time, and minimal to no pain. If you’re wanting to avoid surgery, CyberKnife is surely a tool you may want to try. But, CyberKnife is also often prescribed by medical teams to use with surgery – either before to shrink the tumor or after to make sure the cancer is gone. And if cancer returns, doctors often use CyberKnife for patients who have already had radiation treatment because it is able to pinpoint the exact tumor location and not other parts of the body. CyberKnife does not require the recovery time of surgery, and it also is much faster than traditional radiation therapies, allowing you to return to your normal daily activities as soon as two hours after treatment. Full CyberKnife treatment can typically be completed in less than 5 days. This is compared to other radiation treatments which often require daily treatments for three to nine weeks. The CyberKnife treatment is administered in a comfortable treatment couch while you listen to music at our conveniently located Phoenix location. Other treatments require the immobilization of parts or your whole body with restrictive frames or casts, but the CyberKnife tracking system allows you to rest comfortably while it does its work. Precision is the key to effective cancer treatment and the CyberKnife system is the most precise tool out there for delivery of high-dose radiation. The cutting-edge technology combines a flexible, robotic arm with high-speed imaging and sophisticated software to track your tumor at even the slightest movement. CyberKnife can track tumors in real-time, even as you inhale and exhale. 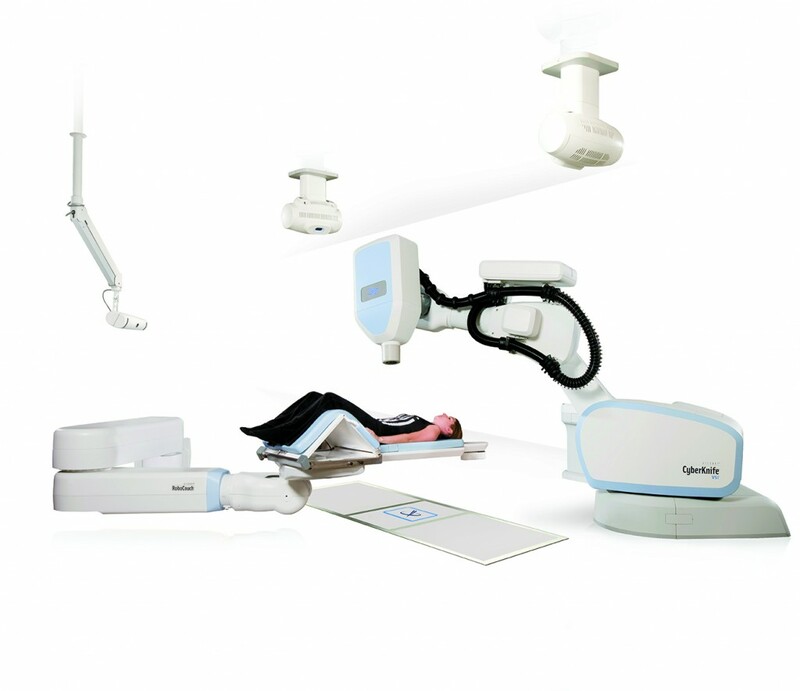 One look at CyberKnife’s robotic arm versus the conventional radiation machines and you’ll see how much easier it is for CyberKnife to move at any angle and reach tumors in even the most difficult locations. The precision of CyberKnife not only focuses the correct dose of radiation on the cancerous cells, it leaves the surrounding healthy tissue and organs unharmed. This is critical when tumors are so close to organs that provide everyday functions such as the brain, lungs, kidneys and prostate. Avoiding radiation overflow also helps greatly lessen any potential side effects of the radiation. You may hear your doctor refer to SRS or SRT (stereotactic radiotherapy) if you have a tumor in or near the brain, head/neck or spinal cord, and SBRT (stereotactic body radiotherapy) or SABR (stereotactic ablative radiotherapy) when talking about treating tumors in other parts of the body. This is because most systems can only treat tumors in certain parts of the body. CyberKnife is the only dedicated robotic radiosurgery system available today that can deliver this precise radiation anywhere in the body, including hard-to-find spots in the brain, head, neck, spine, lung, prostate, liver, pancreas, and other soft tissue. Most importantly, you can trust that CyberKnife will work, as it is clinically proven effective in treating cancer. What Types of Cancer Does CyberKnife Treat? Unequaled Accuracy – The CyberKnife follows, detects, and corrects for any patient or tumor movement without interruption and with an accuracy not found in any other available treatment. Much Shorter Treatment – CyberKnife is one short session per day for one to five days instead of daily treatments for up to 45 days. Relaxing Atmosphere – Comfortable treatment couch in outpatient clinic where you can breathe normally and listen to music. No invasive head frames or body restrictions. Personalized – Treatments are custom-made for your specific tumor shape and stage to ensure best possible outcome. Fewer Side Effects – By pinpointing only the cancer, there’s no damage to surrounding healthy tissue which means less negative side effects. Non-surgical – Painless, no cutting of any kind and no surgery or anesthesia. Hope For Challenges – Reaches inoperable or surgically-challenging tumors. Treats those unable or unwilling to undergo surgery. Safe – Outcomes & quality of life unequaled by other radiosurgery systems. Insurance Approved – Approved by Medicare and most insurance companies for treatment throughout the body. Once diagnosed with cancer, you or your doctor will contact the specialists at Palo Verde Cancer Specialists. All of the members of your medical team will conference with you to determine the best treatment plan for your specific situation. If needed, your team may place a tiny gold marker near your tumor(s) to help identify exact location(s) during treatment. This is done only for tumors in the liver, pancreas, kidney and prostate. Imaging is performed to simulate the size, location and density of your tumor and used for the customized treatment plan. Using the images, data is digitally transferred to the CyberKnife System where your Palo Verde Cancer Specialists doctors and medical team create a plan to match the radiation dose to the tumor and limit exposure to surrounding healthy tissue and organs. During treatments at Palo Verde Cancer Specialists, the computer-controlled robot, assisted by the highly trained radiation therapy technician, will carefully move around you, beaming high doses of radiation directly to your tumors. The system will take continuous X-rays to track and follow any movement of the tumors, and correct for the slightest movement before each radiation beam is delivered. Most CyberKnife patients experience no side-effects after any of their one to five treatments. Call Today To Find Out More About CyberKnife Treatment! Don’t wait another day to contact Palo Verde Cancer Specialists and find out more about the effective CyberKnife system and the benefits it could bring to you. Contact our board certified oncologists at one of our five convenient locations in Phoenix, Scottsdale, Glendale or Payson to schedule a phone consultation or your first visit. We look forward to learning more about your specific case and providing you with the answers to all of your questions regarding CyberKnife and the many other radiation cancer treatments we provide.